Antibalas On World Cafe : World Cafe The rhythm-intensive Afrobeat ensemble is back with its first album in nearly five years. 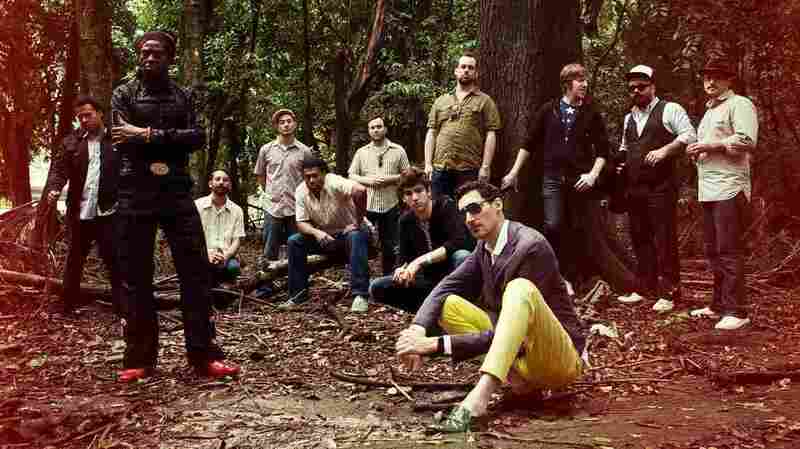 'Him Belly No Go Sweet"
Sometimes known as the Antibalas Afrobeat Orchestra, the New York band Antibalas — which means "bulletproof" in Spanish — is a large group of talented musicians who play rhythm-intensive Afrobeat music. In a seven-year stretch, Antibalas has released four albums and withstood a five-year hiatus in which several members worked on the Broadway musical FELA! On Antibalas' new self-titled album, the band makes a fun, globe-trotting ruckus. Hear the group perform songs from the record on this session for World Cafe.